The selected operational orbit is inertially fixed, so that coverage of all planetocentric longitudes can be accomplished in one Venus sidereal day (243 Earth days). The nominal mission lifetime was two Venus sidereal days (roughly 500 Earth days) following orbit insertion in April 2006. Several mission extensions have pushed back the mission end date and Venus Express operations will now continue up to 31 December 2014. By end 2012 Venus Express observations will have been performed for ten Venus sidereal days. The Venus Express mission aims at exploring the Venusian atmosphere, the plasma environment and the surface characteristics of Venus from orbit. 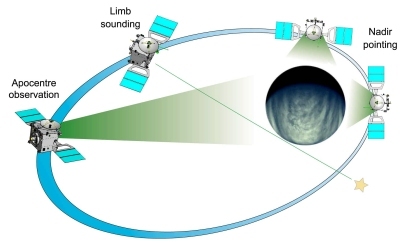 A high inclination elliptical orbit provides complete latitudinal coverage and gives the best compromise for allowing high-resolution observations near pericentre, global observations during the apoapse part of the orbit, and measurements of the Venusian plasma environment and its interaction with the solar wind. The selected orbit is ideal for combining global studies of large-scale phenomena from the apocentre part of the orbit with detailed studies at high resolution at pericentre. An operational advantage of this type of orbit is that the communication with the Earth can be achieved with only one ground station and that, due to the orbit period, the time slot for communication is at the same time of day throughout the mission. The only major perturbation affecting the orbit of Venus Express is the effect of solar gravity, which raises the periapse. Over one Venus sidereal day (243 Earth days) the periapse altitude increases by approximately 170 kilometres. To counteract this effect, the periapse is - and will be - lowered as necessary throughout the duration of the mission by using the spacecraft's thrusters. The second order spherical harmonic (J2) term of Venus's gravity field, caused primarily by planetary dynamic oblateness effects, is low, so orbit apse rotation and nodal regression are very small. There are two different phases of operations for Venus Express in its operational orbit: the Earth Pointing phase and the Observation phase. 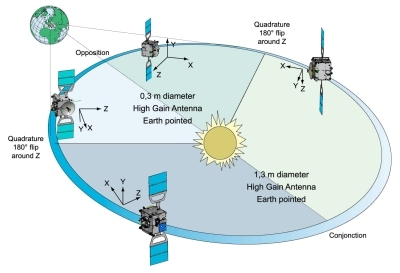 The main High Gain Antenna HGA1, derived from Mars Express but with a smaller diameter (1.3 m instead of 1.6 m), is used during three fourth of the mission, when the spacecraft is the most distant from Earth. In the middle of this period, Venus is in superior conjunction. The second High Gain Antenna HGA2, derived from Rosetta, is used during the remaining one fourth of the mission, when Venus is closer to Earth. In the middle of this period, Venus is in inferior conjunction. The rotation angle around the Earth direction is optimised in order to avoid any entrance of Sun light on the side walls radiators. High rate communication are performed 8 hours per day in X-band, in order to transmit to Earth all science data stored in the Solid State Mass Memory. An average of 2 Gbits of science data is downlinked every day to the new ESA ground station of Cebreros, Spain. During observation, the Sun can illuminate under transient conditions any spacecraft face, except for the cold face. The duration of observation is therefore limited by thermal constraints and by battery discharge. The maximum duration of an observation period depends on the Sun direction with respect to the orbit plane, which varies along the mission.